Publisher: Dancing Twiga Press, Inc.
An intense search for her father brings other truths and challenges into Maria Nhambu’s life as she discovers the complex details of her origins. In Drum Beats, Heart Beats we learn how life continues challenging the one-time orphan: the family she worked so hard for suffers harsh blows; her Florida home is affected by a hurricane; she says good-bye to her large African art collection, lovingly gathered over decades; and her very life is threatened several times. Yet with her orphanage-bred resilience and the help of Fat May, her inner counselor, Nhambu builds on her strengths and overcomes these difficulties. Africa’s rich cultures and history, stunning natural beauty, and welcoming people continue to support and nourish her. In Drum Beats, Heart Beats the author takes us on a safari of her beloved country and we see its wonders through her eyes and her heart. The first book of the trilogy, Africa’s Child, was released in 2016. America’s Daughter was published in 2017. 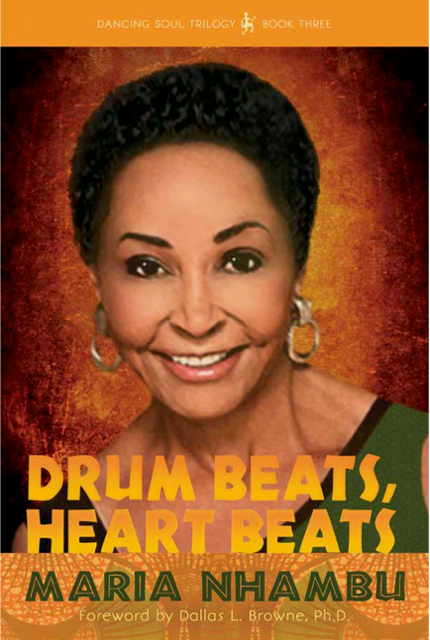 The final book of her memoir series, Drum Beats, Heart Beats, was released in 2018. Africa’s Child is now available in audiobook. “Drum Beats, Heart Beats completes a remarkable autobiography that is much more than one person’s story. The reader will gain insights into some of the cultural norms that surround us and into the evolution of our own closest relationships.” —Walter Graff, LL.B.